Feminists for Life of America President Serrin Foster remembered the contributions of the late Pakistani Prime Minister Benazir Bhutto as an international advocate for women and children, born and unborn, especially those in developing countries. 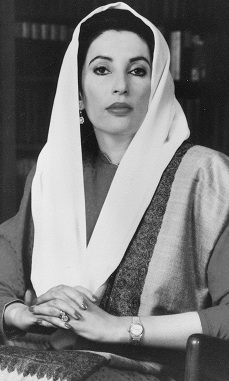 Foster recalled Bhutto’s focus on women-centered solutions and opposition to the exportation of abortion to developing countries when she addressed a thousand delegates at the 1995 U.S. Department of State “Bringing Cairo Home” conference. Foster drew parallels between the obstacles faced by the early American feminists and the needs of women in developing countries as we approached the 21st century. “Bhutto’s definition of empowerment echoed the long list of women’s rights demanded by pro-life feminist leader Elizabeth Cady Stanton, who in 1848 organized the first women’s convention in Seneca Falls, New York. Bhutto’s solutions also echoed those of the great feminist organizer, Susan B. Anthony, who advocated women’s rights, and who urged society to address the root causes that lead women to abortion,” Foster said while reflecting on the many contributions of Benazir Bhutto. “While separated by time and space, Susan B. Anthony and Benazir Bhutto both understood the need to address the lack of support and resources for women, and our responsibility as a society to work together to eradicate these causes,” Foster said. An excerpt of Bhutto’s speech delivered to the U.N. Fourth World Conference on Women in Beijing, China, was included in an anthology on “Women’s Rights” one in a series entitled “Great Speeches in History,” along with those by pro-life feminists Susan B. Anthony, Elizabeth Cady Stanton; 70’s women’s movement leaders Betty Friedan, Gloria Steinem, Sarah Weddington; and contemporary women leaders including former president of NARAL Kate Michelman, Senator Hillary Rodham Clinton and Feminists for Life President Serrin Foster. In 1998, Feminists for Life recognized then-Prime Minister Benazir Bhutto among Remarkable Pro-Life Women® for her advocacy of women and children around the world.